WeFunk expanded to include its own internet radio stream in 1999, becoming one of the oldest continuously operating radio streams on the internet, as well as one of the longest-running online radio shows. Since 2001, Apple has featured WeFunk in its iTunes radio directory, introducing the show to a large worldwide audience. 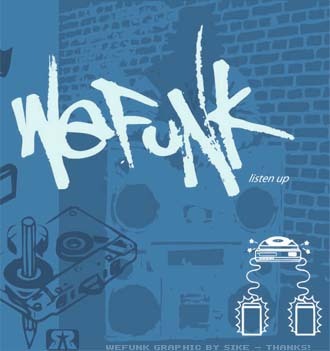 WeFunk was awarded “College Radio Show of the Year” in 2007 at the Stylus DJ Awards, a Canadian nation-wide urban music awards event. WeFunk was voted into the Montreal Mirror’s top 10 “Best Local Radio Show” lists in their annual “Best of Montreal” reader’s poll in 2009, 2008, 2006, 2005, and 2004. Esquire Magazine noted WeFunk for “grooves so gloriously nasty, they make James Brown look like Pat Boone”. The New Haven Advocate wrote, “If you’re looking for ‘brash funk hypeness, hip-hop deep in the pocket,’ screw the mainstream. This is it.” Fortune Magazine wrote, “WeFunkRadio.com is just totally beautiful!” Wired Magazine wrote that WeFunk “keeps us going strong”. ← Stickeri is up and running!